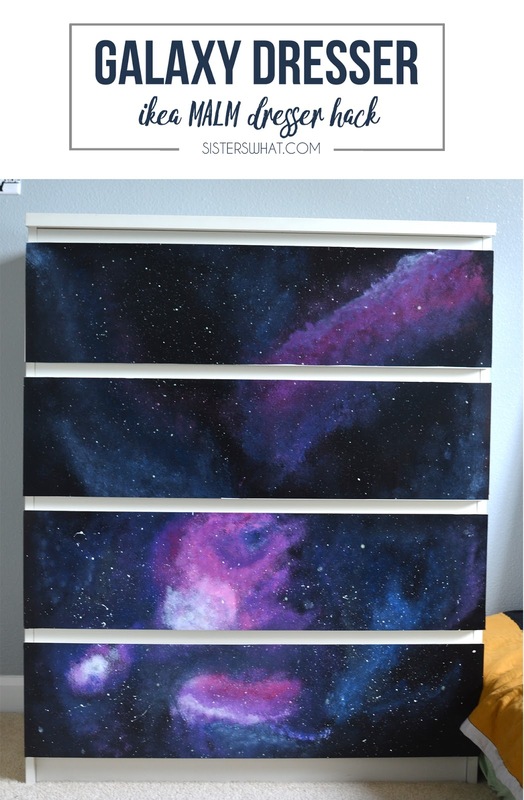 ' Galaxy Dresser - Ikea MALM dresser hack (using contact paper!) - Sisters, What! This Ikea MALM dresser hack was a fun update using contact paper and can be taken off at any time. 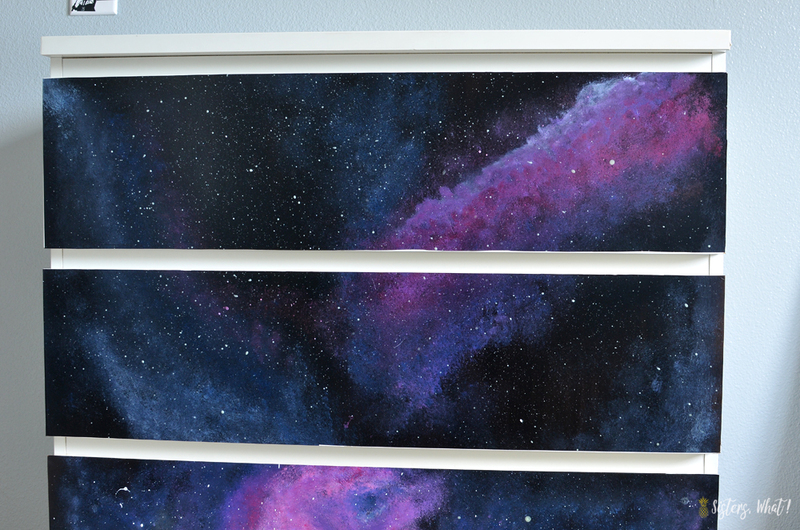 It's perfect for a kids room, a space room or any room really. This post may contain affiliate links. Thanks for supporting Sisters, What! 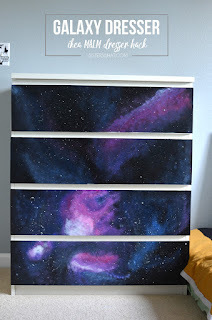 I've been going through old pictures and I came across the Ikea MALM dresser hack that I changed up to a galaxy dresser. For my boys room we had a space theme planned, so I thought I'd try out some galaxy painting. BUT, I didn't want to do it right on the actual dresser. I didn't have that much confidence in my painting skills...so I bought some black contact paper. It was cheap enough for me to take the risk and ruin. Better than ruining a dresser. 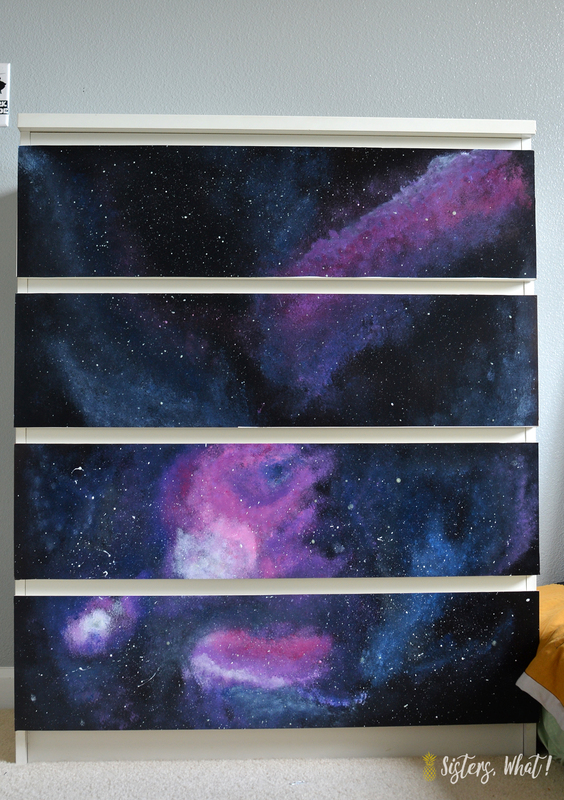 Plus, I figured, if we ever got tired of galaxy on the dresser, we can easily just take it off. AND the whiteness of the dresser can be preserved a little longer. I was really happy how it turned out. Not what I expected, but my husband and kiddos both said it looked liked a Galaxy and that is all that matters since they would be the ones looking at it. But you want to know the real irony of this whole thing, it got taken out of their room before we actually finished putting all the space/Star Wars art on their walls in order to move in the 2 year old into the room. They really wanted to all sleep in the same room...So...now the room does finally have their cool space/Star Wars art up and the dresser is in the other room. A shame, but that's life. 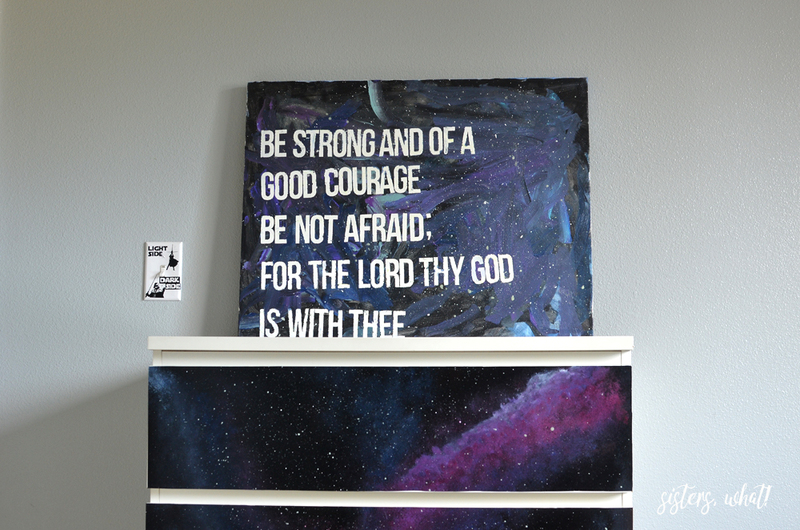 I did however, get the boys to paint their own galaxy scripture art and that is still in their room...so that's something. I actually kind of love theirs more. Kids are just awesome sometimes when it comes to painting. 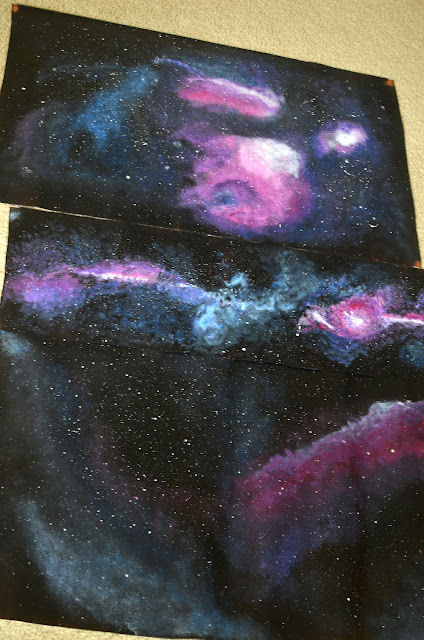 Ok, I didn't do a video or anything since I was just winging it, but I looked up tons of galaxy art online and started just painting. I started with lighter colors first and did lots of blending of darker colors on top. I ended it all with flicking TONS of glow in the dark paint and white paint to be the stars.